Do the right thing for the customer. Admit what you don't know when asked a question. Offer to find out and get back to them, and then do it quicker than you said you would. Admit and acknowledge your mistakes and shortcomings and make a commitment to rectify them. The Boy Scout motto lists desirable character traits: trustworthy, loyal, helpful, friendly, courteous, kind, obedient, thrifty, brave, clean, and reverent. Sweetwater has been growing 18-21% every year since 2000. 13 years ago they have 137 employees and 2,000 new customers a month. Now they have ten times the number of employees and 70,000 new customers a month. Check out their job listings. This year they will hire 450 new employees including 15 new sales engineers every 6 weeks. Their marketing department has over 100 people in it. Not long ago they doubled in size. In 18 months they will expand from 300,000 square feet to 700,000 square feet. Guitar techs make $13-14 an hour, warehouse staff $13 an hour. They have a recording studio and it is a profit center, but only 9 people work there. Sweetwater owns the Clyde Theatre, and between it and their events on the Sweetwater campus they have 30 people working in live sound. Sales engineers start with a salary guarantee in the mid 30Ks. In the second year they go on commission, with an average earning of 35K. The average for the second year is 53K, in the 5th year 75-85K, and six figures after 10 years. 15% of the sales staff makes $95,000 or more a year. There are now 400 sales engineers, most have their own home studios. They have 40 different types of internships in their 10-week summer program. About 10% of their employees started as interns. They pay $10 an hour and have worked out a deal with PFW so that you can live in the dorms for about $24 a night. It's recommended to apply in December since they are filled up by February. What they look for: the "Three-legged stool"
Technical qualifications. A bachelor's degree or industry experience is desirable. You must know enough enough about gear in order to be prepared to keep up with the 13-week intensive training program called Sweetwater U, which is like a master's degree in music products. MMP 280 (Music Retail Products) is taught online in the summer to help you prepare for the comprehensive products exam. Relationship skills. You need to be able to communicate with other people. Take your speech class seriously. Fire in the the belly. You've got to have the desire to be a team who is team- and service-oriented. If you're in sales you'll be making 80 phone calls a day and 450 a week. All three of those qualities are essential and have to be solid. What sits on top of those three legs is the seat, which represents how well you fit into the culture. Do you want to be there and work hard? Are you passionate about helping people? Prepare yourself for the interview. Be able to tell a short story about yourself. Thoroughly research their website and investigate the people you'll be meeting. Manage your social media since your potential employers will be checking you out, like you're checking them out. ​Sweetwater is part of the MMP program's DNA. Their CEO, Chuck Surack, was instrumental in convincing state officials to fund the construction of our facilities. Many of our music technology and production graduates have or are working there. 298 Ball State students have applied for positions there, 28 are now on staff. Learn more about what Jeff McDonald looks for when considering applicants by listening to a talk he gave on careers at Sweetwater, and a subsequent conversation with a student. The average community music store sells $700-800,000 a year. The Guitar Center in Indianapolis sells about $2,000,000, the store in Chicago does $6,000,000. Sweetwater does most of their business over the phone and online, but they also have a store on site that sells about $13,000,000 a year. Each Sweetwater sales engineer in one of these cubicles is like a music store, many sell around $7,000,000 a year. Take a virtual tour of Sweetwater's Campus. They have recording studios, theatre, resident reps from Yamaha and Avid, and a steady stream of visitors from manufacturers. They offer many resources to make work conditions more pleasant, including a fitness center with trainer, racquetball court, virtual golf, arcade, restaurant, hair salon, dry cleaning and postal services, massage therapist, a DVD lending library, and employee discounts on gear. 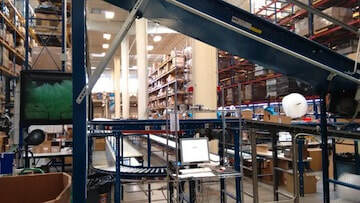 Sweetwater has invested a million dollars in their high tech conveyor built to keep the warehouse operating efficiently. They are looking for self-starters, high-energy, smart people who will add to the positivity rather than take away from it. Talent Acquisitions Specialist Missy Lyons says "You got to run fast!" The challenge is to build up 4,000 customers in your first 18 months. 3.5 out of 10 don't make it. Once you get past your second year the job gets easier, but you continue to make around 90 phone calls a day. Sweetwater is located in Fort Wayne and is one of the brightest lights in the Indiana Music Business scene. They are expanding rapidly and if you are sharp, have a capacity to learn, are interested in music technology and knowing all about all types of gear, want to work with other musicians hooking up clients with the right products and seeing that they get the most out of them, you may wish to consider interning or seeking a position there. In addition to doing the right thing for customers, Sweetwater strives to create a high performance culture that is stimulating and fun to be part of. The Sweetwater Minute is a series of hundreds of videos featuring Editorial Director Mitch Gallagher interviewing leading performers and music manufacturing representatives. Many employees are interviewed on the Sweetwater Minute or have their own web pages, including Greg Baitz (Dean of Sweetwater U), Jeffrey Green, a longtime sales engineer there and recipient of the School of Music's Distinguished Alumni award in 2012, Jeff McDonald (director of Human Resources) and Doug Hills (sales manager). Chuck Surack helped celebrate the 250th episode of the Sweetwater Minute talks about his background as a musician, Gear Fest, their growth, facility, entrepreneurship, vision, and performing. Check out the conversations on The Open Road for more understanding of the man and his mission [ part 1 ] [ part 2 ]. Listen to the interview on the Art + Music + Technology podcast to learn how he got his start in mobile recording and a sound designer for the Kurzweil K250. 1.5% of their business comes from their retail shop (which should increase now after the floorspace has doubled). 1% comes from their studio business. They rarely hire engineers. Those they do hire are strong performers and/or composers/arrangers as well. The day we visited they were working on a project with Sypra Gyro. 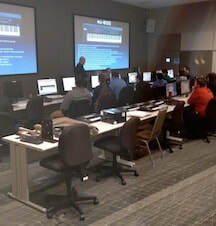 Watch the presentations by Greg Baitz and Jeff McDonald available through the MMP Organization part of Blackboard. I asked Matt McKible, one of our grads working there, for ideas on how we could improve our program. "Personally, I think there should be emphasis on specific products, but by the time the students graduate, they will all be different and most of the products discussed will be gone. The one big segment of our business that stays fairly constant is guitars. Being a guitarist in college, I knew enough to get by, but it is a huge part of our growth here and something that everyone should be comfortable with when working here." Their entrance exam covers topics including guitars, drums, keyboards, microphones, signal flow, and terminology. 50% is considered a very good score. The best way to work into the company is to start with an internship your junior year. It takes 1-3 months to go through the interview process. Start applying around Christmas if you're looking to start a job after graduating in May. Their glossary of terms is a great resource, and can be useful in preparing for the technical exam recruits are given. Check out the Sweetwater Minutes, a huge catalog of interviews done by Mitch Gallagher on a wide range of topics.